Part of the photographer’s challenge lies in capturing a familiar scene in a startling and original way, and Michel Setboun has succeeded in his beautiful work, Bell Towers of Paris. The acclaimed photojournalist spent five years climbing the steps of the French capital’s famed bell towers (most of them inaccessible to the public), cutting a bird’s-eye-view trail through the city that he records lovingly in the pages of this spectacular book. From Notre Dame to Invalides, Sacré- Cœur to Hôtel de Ville, here are 160 breathtaking views of the City of Light as even its long-term residents have never experienced it—adrift and timeless. 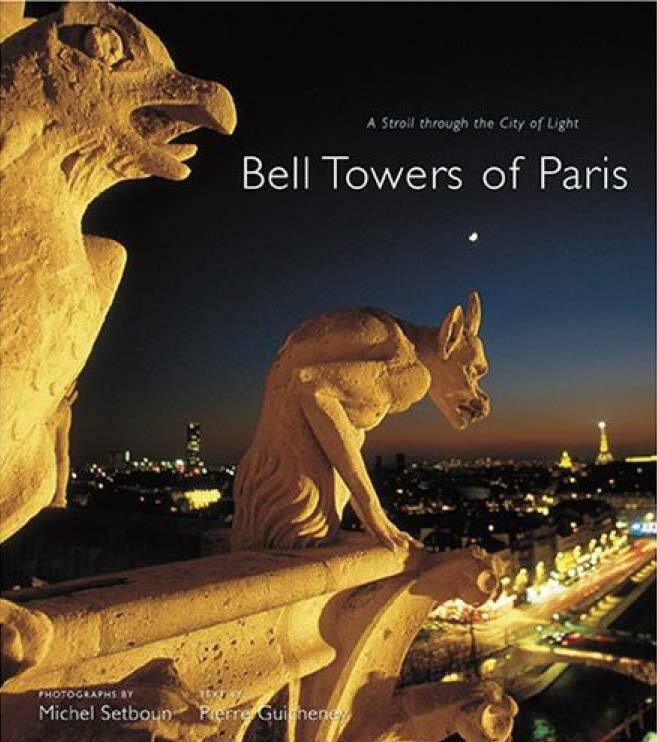 With a helpful map, and informative historical text by French journalist Pierre Guicheney, Bell Towers of Paris provides a whole new way of seeing one of the world’s most beguiling cities. Let's be honest: dozens of books about Paris are coming out every year. Among them, very few hold our attention, as they are often ordinary and uninteresting. Sometimes however, out of the hordes come some albums that move and impress us. And then, once every two or three years, a masterpiece emerges. Like "Paris, la balade des clochers". Because it allies glorious images from some of the biggest names in photography, has real personality and magnificent print quality, a very clever layout and good text which is another plus, this book by Michel Setboun and Pierre Guicheney is of this calibre. Not only will lovers of the city discover here a Paris that they have never imagined, the lighting of the images so incredible that they resemble paintings, amazing work, unbelievable perspectives, and also a text that is at the same time informative and intelligent without ever being off-putting. It's so often the case, in those which we call "beautiful books", to find distressing text as a bad pretext for creating artificial cliches, that the osmosis achieved here between the eye and the pen is absolutely a major success. With this unique perspective, this team of a well-traveled photographer and of a journalist writer who really knows how to tell a story, makes a masterpiece that every Parisian must have in their library collection. Pierre Billard in « Paris capitale » (novembre 2004). « In truth , I tell you » these are the most beautiful and astonishing photos that we’ve seen of Paris . These photos will make you fall crazy in love with the architecture, the history: each cobblestone and each stone of the capital. Michel Setboun has made an exceptional piece of work. You must observe in detail every image of this 288 page book of which we have extracted 11 pages. A difficult choice, we would have done it blindfolded. That’s how much each of the images of this work deserves to be selected. Do you think we’re exaggerating? Have a look and judge yourself. When new images of Paris surprise us, fascinate us, cast a spell on us and carry us away, it's that the magic of a particular shot of our streets and monuments is working. And that the mystery of the faith in a capital is seen as never before, because it possesses a soul, and has become a reality. Soul, the word is not by accident as long as the vision of this city that many do not see anymore - or do not see well - due to always having the eyes fixed on ground level, is original and impregnated with spirituality. For this regard, this exceptional point of view - in every sense of the term - is coming from above. Not from an airplane but from this go-between, the link between man and Heaven, between the mortals and the divine: the churches. Better yet: the towers of the Parisian churches. The photographer Michel Setboun, forever passionate about this city he calls his own, metamorphoses our vision. Paris, la balade des clochers [the steeple stroll] is a voyage between Heaven and Earth, a journey rich with surprises at the heart of the forest of stone that floats over us, a route as visual, as it is historical and spiritual at a dozen or so meters above our heads; a dizzying journey. From Notre-Dame to Invalides, from Sacre-c?ur to the Tour Saint-Jacques, the watch towers of the Hotel de Ville to the chimeras of Sainte-Clotilde... not one of these bell towers with so much to talk about, so much to see, escapes the lenses of Michel Setboun. Because they trace, even today, the route that sanctifies the spiritual voyage towards Saint-Jacques-de-Compostelle, these towers of faith offer a vision of Paris past and present, both at the same time. If, in certain districts more on the outskirts, going up to the gargoyles doesn't procure any sensation of eternity as long as the view stops at the vertical buildings of the 1970s and the vision is obstructed by ugly buildings transformed into distressing walls, visiting the bell towers in the heart of the capital allows us to discover a timeless Lutece. Like a bird perched after having wandered about for five years from tower to tower, the photographer shows how the city speaks to us about its medieval past, reminding us how Emile Zola and Victor Hugo knew how to describe it, offering us a new deciphering of our visual patrimony. From sunrise to sunset, having climbed up millions of stairways, having been in the places where pretty much no one goes anymore because of the danger and in others closed to the public, having crept up and down hundreds of steps like a snail, running into a dozen or so of vergers or sextons, he magnifies our Paris and gives it a fascinating beauty boost. In the middle of this book, in the center of the author's cross, in the center of the capital as well, stands the mother church: Notre-Dame de Paris. If she is not the oldest religious edifice of the city, nor the summit of gothic art - the specialists prefer Saint-Denis -, by her location, and the symbols she incarnates, she signs in arches of stone and letters of blood the most beautiful pages of the capital. The Hunchback of Notre Dame, Quasimodo, haunted her, and today, twelve million visitors come, each year, attempting to discover, in her chimeras, the voices of eternity and try to distinguish, in her stain glass windows, bits of divine light. Emblem of the fierce empire builder of the Middle Ages, subject of quarrels amongst architects when Viollet-le-Duc restored her, she seemed to be open to all while withholding well-hidden mysteries. Who knows, indeed, that the great bell called Emmanuel in 1686 - measuring 2,61 meters in diameter and weighing twelve tons - is the only one spared in the revolutionary vengeances of 1792 while the nineteen other bells were destroyed? Who knows that it is only rung during big ceremonies and that the sound heard in ordinary circumstances is recorded on tape? But from up there, what a view. Of all of Paris as well as of the monsters sculpted in eternity. A view of the Seine river, as well as of the Institute. A viewpoint and also an anchorage point, better yet, a starting point for launching into the pursuit of rock diamonds, these other churches that are a sign of faith, peace and history in the heart of the city. A few steps away, on the other side of the Seine, is found the Saint-Germain-des-Pres church - consecrated basilica in 558 by the king Childebert who had brought to it a piece of the True Cross - and the tomb of the bishop Germain who worked wonders. Since these days gone by, the miraculous healers have lost their intensity and frequency but some still come to venerate the saint Rita, the patron of desperate causes, of which a statue decorates the entrance on the rue de 1'Abbaye. A bit further, she has also has become the emblem of this eminently literary quarter, Saint-Sulpice stands proud with her towers of two different heights: 73 and 68 meters. Visitors can see the sculptures of Pigalle and Slodtz, the frescos of Delacroix, a mysterious element that inspired Dan Brown for his best seller the "Da Vinci Code" and a magnificent... but perilous... panorama. Because the two towers are in bad shape. They are accessed by a winding staircase, narrow corridors, and steps that have become uneven over time. But, from up there, the whole city opens up: we can admire the Invalides, the Eiffel Tower, the Grand Palais and even the towers of La Defence, glass and steel paragons of another religion, that of business. Money wise, Puteaux has a lot of it, but it was quite necessary in order to, in another era, build the Saint-Chapelleand acquire the relics it was to contain. Imprisoned in the Palais de Justice of Paris, this architectural jewel was established by the most mystical of sovereigns, Louis DC, in a time where all religious edifices were obliged, in order to attract the faithful and the donators, to have relics. It just so happens that Saint Louis was burning to offer to France the most precious of them all, those of Christ himself. To be noted: "the cross of thorns, a fragment of the Cross, a splinter of the spear" which pierced his side, "a piece of the sponge that served to wet his lips with vinegar, a piece of the rock of saint sepulchre"... Against the equivalent of the annual revenues of die royal domain, the king thus bought these treasures from Venetian bankers and gave them the most precious and magnificent dwelling: the Saint-Chapelle, illuminated by its 750 square meters of stain glass windows whose purpose is to give visitors the impression, hand picked, to float in the light of the holy word revealed. If the Revolution dispersed of eighty of the relics, the precious crown was hidden in a secret spot and, ever since, deposited in Notre Dame. The other pieces found are enclosed in the ball on the tip of the spire of the edifice achieved in 1853. The most amusing thing is, once we're up there, to know that the faces sculpted in the stone which are supposed to be kings, are actually entrepreneurs of the Middle Ages in charge of the construction of the building; characters rejoicing to be higher up than the sovereign mere mortals themselves. If the royalty had anchored their faith in Saint-Chapelle, the hotel des Invalides has become the symbol of the Empire. Created by Louis XIV in order to lodge the veterans of his armies and the badly injured war victims, the hostel-hospital welcomed, in 1861 on the initiative of Louis-Philippe, the ashes of Napoleon. In the church of the Dome, royal chapel turned into military necropolis, the colossal imperial tomb in red porphyry of Carelie contrasts with the modest hatch that opens onto the roof where the implacable perspective of the esplanade of the Invalides blows one's mind. Another surprise: above the marble intelligently protecting the floors, we find gold leafing on the Dome, renovated for the bicentennial of the Revolution, fraying for having been inlayed too quickly. The same discrepancy suddenly appears in other edifices. As much as for the sovereigns as for the clergymen - not to delude us, the representatives of God and of power have always mixed well, each one trying to show through a building how important he is - in the glorious centuries past they rivaled for noble materials, artistic and architectural exuberance; as much as the middle class of the 19th century rather preferred the modesty of respectability, tinged with a certain comfort. Some churches built in the north of Paris confirm this. At Saint-Augustin, they said "no" to mineral pavements judged to be too cold and opted for the warmth of hardwood flooring. And the architect Baltard, the one who did the "pavilions" and "les Halles", chosen by Haussmann, put his heart into it. At Sacre-C? ur , erected thanks to a law in 1873, the same sobriety - it's obviously relative, but however - prevails. And the viewpoint is also worth making a detour for, as much as for this church much less assaulted by tourists than Notre-Dame. The Trinity church, erected between 1824 and 1844, respects this serenity of visits: here one comes to pray in fervor and not just as a passing tourist. A few steps away from the Gate de 1'Est, a little known church, Saint-Laurent, is planted at the intersection of the boulevards Strasbourg and Magenta. It's interest is that it is on the famous "cardo maximus", the ancient major North-South axe designed by the engineers of the Roman Empire . A major division that also became the pilgrimage road to Saint-Jacques-de-Compostelle, at the center of which is found the Saint-Jacques tower, constructed in 1522, a unique vestige of Saint-Jacques-La-Boucherie, the church of this corporation founded in 1797. Decidedly badly considered, this tower did not have much luck at the end of the 19th century when the municipality bought it and the enterprising construction work resulted in the statue of Saint Jacques, who dominates it, being put facing the wrong way. Instead of looking toward the Galicie, the pious man was put facing Beaubourg! If the tower is under construction, the local weather stations that it houses since 1891 they too, are in activity. From Heaven to the clouds, ever so logical. In fact, we could write pages and pages about this work portraying a very different Paris , seen through the prism of those who want to uphold their faith. We could also evoke Saint-Severin, the Pantheon, Saint-Gervais, Saint-Germain-1'Auxerrois and so many others, but better to let the magic operate. The magic of these images is carefully worked, and the text is spewing out all sorts of information and anecdotes. At the end of this voyage toward Heaven, of this lovely escape in the peaks of the city, we have, at the end of it all, one regret: that is to not have found ourselves in the company of the authors to admire, with them, this very different Paris as seen from a new perspective... as seen from above. Between the photographer Michel Setboun and the special correspondent reporter Pierre Guicheney, the osmosis is complete. If the concept of this book came first, the second step was to stick to it spiritedly, only too happy to inscribe their steps into the heart of what the great authors wrote about Paris ... a journey above the capital not always easy to come by. - How did the idea for this book come about? - Michel Setboun : It happened in Venice ! I was on the deck of an ocean liner, in the middle of reading Notre Dame de Paris de Victor Hugo, as we arrived at the Great Canal . And there, I had a shock: as I found myself almost at the same level as the eighth floor of a building, I suddenly had the desire to see things from another perspective. And to look at Paris , where I have always lived, differently. - And you, Pierre Guicheney, you adhered to this project immediately? - Pierre Guicheney : Right away I like the idea of this voyage above men and time. I felt it procured a physical rapport to the city that I have never had. In going up toward the douds, to the conquest of the church towers, which conceal a world all their own crammed full of stairs, sculptures... one discovers a secret and historical face of Paris . Thanks to Michel's photos, we have created a pathway through the city, which is logical and moving. I therefore followed his path, sometimes alone, sometimes with him, in order to explain, in addition to his point of view, what is going on up there. I've found again the magic part of our city. From the perspective of these church towers in the heart of the capital, I was able to revive within myself a Paris which I no longer saw. I have, for example, stood again at Notre Dame realizing that the cross of thorns of Christ was there. It was a true exercise of my memory. - MS : This work has a bit of mysticism to it. I help each one to see how our capital is enrolled in its continuity and allow it to step out of the day to day. - That must not be necessarily very easy to do? - MS : Notably because of vertigo... We sometimes had to go along very narrow gangways without guardrails, like at the Conciergerie. Other times, we had to follow real mazes to get to the top, like at Saint-Augustin where we had the impression to be doing a remake for the "Norn de la Rose" with the never-ending stairways, strange tunnels, and passages over open voids. Certain priests refused giving authorization to photograph because of security problems. As was the case, at Saint-Gervais, since the storm of 1999, the guardrail of the church tower was never replaced! Later, I had to solve technical questions. As I never use filters or special effects, all depended on the light. For the moment, I photographed more or less in the winter because in the summer the churches close late and the pollution makes the sky look a bit gray. But going so high in the heart of Paris , Pierre and I felt like Quasimodo: masters of the city placed higher than others, holding in our hands the clouds of eternity.